Back before LoCoFlo started, my friends and I did flower arranging as a hobby. We fondly call this time “back when we didn’t know what we were doing”. What we lacked in know how we made up for in enthusiasm (which is still with us today!) Six years ago today, LoCoFlo co-founder Jen Reese married our friend Dave Bryant on a beautiful May afternoon. In planning for the wedding flowers, we were ambitious and brimming with creativity. We decided shortly after the engagement, that we would grow all the flowers (tulips) ourselves. Of course, we waited until it was snowing (it was literally snowing) to put in the last bulbs. We chose early and late blooming bulbs figuring we’d hit the jackpot and they would all bloom at once. Since this was long before we knew any flower farmers that had early Spring local flowers, we decided as a last minute plan, we would order flowers from the wholesaler. Carla, Marina, Dave’s sister Amy and I loaded up Marina’s station wagon with hydrangeas and roses and headed over to the reception spot to put the flowers together. We also cut Carla’s peonies from her house and found a few bunches of local tulips from a farmer we all used to work for. Chalk it up to extreme naiveté, but Marina and I were in way over our heads with the timing of things! We totally underestimated the amount of time it would take to make 7 bouquets, 7 boutonnieres, loads of tables arrangements and decorate the reception site…not to mention deliver everything AND get to the ceremony on-time to see Jen and Dave get married! Good thing Jen’s family was staying at the bed and breakfast at the reception site. We went around and knocked on doors trying to enlist help! More cousins helped with the “kissing balls” and table arrangements. Oh yeah…and Marina was pregnant! We gave ourselves about 5-6 hours for everything! Despite everything…we made it to the church on time. More importantly-everyone looked beautiful, the flowers looked beautiful and it was a WONDERFUL day! And we are STILL laughing about how we pulled it all together! Happy 6th Anniversary Jen and Dave! I have not been this inspired by a book since Amy Stewart’s Flower Confidential in 2007. Flower Confidential inspired me to start Local Color Flowers back in 2008 and the 50 Mile Bouquet is going to inspire me to grow LoCoFlo into the business I always envisioned. 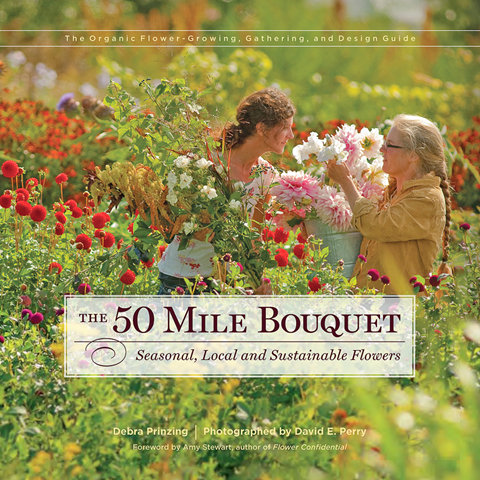 The 50 Mile Bouquet is a beautifully written and photographed book about local flower farmers, designers that specialize in using locally grown flowers and clients that choose to buy local for their weddings and special events. The grower section was great to read because I ACTUALLY KNEW some of the growers! How cool is that to see people you know in a book? Much of the book focuses on the progressive growers in California, Oregon and Washington State. I loved learning about a urban LA flower farm called Silver Lakes Farm that grows beautiful flowers in the middle of Los Angeles! I’ve already referred two west coast friends to them! I was super excited to read about Flora Grubb and the Cutting Garden, an amazing spot that my dear friend Susannah took us to the last time we were in San Francisco. While I LOVED reading about the growers, I was truly inspired reading about so many amazing designers that value local flowers…many of whom, like me, have built their business on buying local. I suddenly felt less alone when I read about designers with untraditional spaces like Lila B. Design, that works out of a loading dock in the Mission in San Francisco. (made me feel better about our garage studio). I felt less like a freak when I read about the ladies at Artis and Greene who have totally rejected floral foam and chemical preservation of flowers. I knew I was on the right track when I read about Max Gill, the floral designer from Chez Panisse that forages in his Berkeley neighborhood for interesting design ingredients. I actually cried several times while reading the book because I felt so…included! I was so proud of these growers and designers I was reading about and I was proud of the community we are building at Local Color Flowers. I was proud that we are building a business on beautiful local products and inspired relationships with our growers and clients. 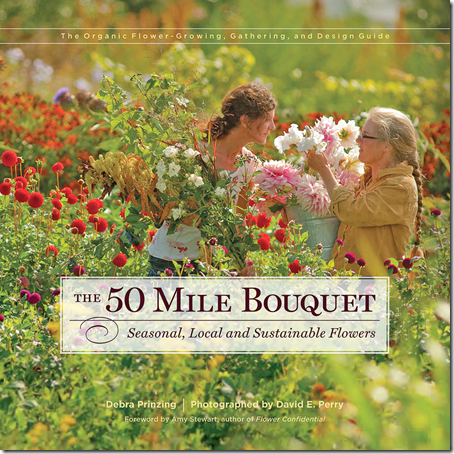 If you get the chance, read the 50 Mile Bouquet! You won’t be disappointed!